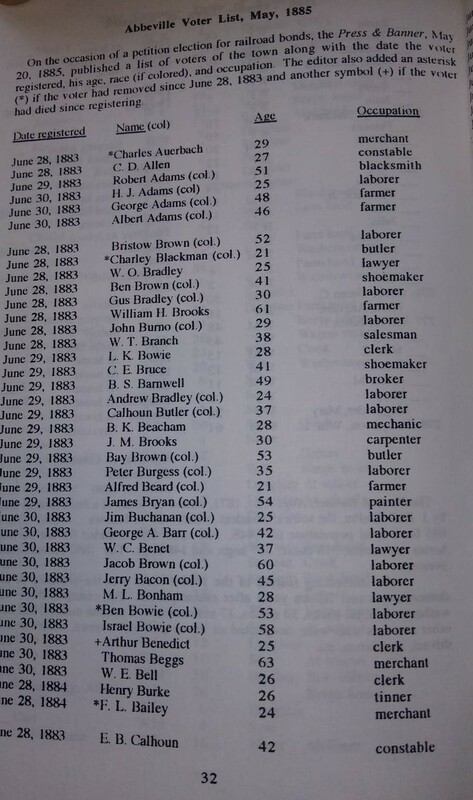 Last month I accessed a book online entitled “Census of Abbeville Village and Abbeville Voter List May 1885,” compiled by Lowry Ware held by Larry A. Jackson Library at Lander University. 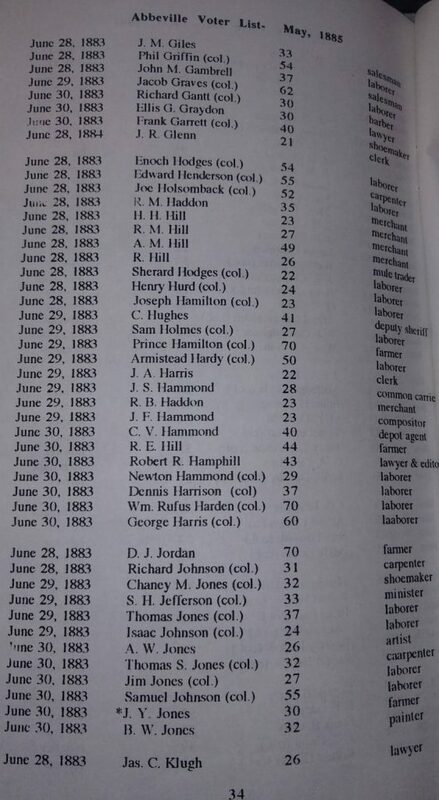 I really had found another way to identify African Americans in 1885 and in 1893 in the town of Abbeville. This is a great resource for African American genealogy for the time period. Most of the 1890 U.S. Census was destroyed by fire, leaving a leaving a 20 year gap between the 1880 and 1900 census. 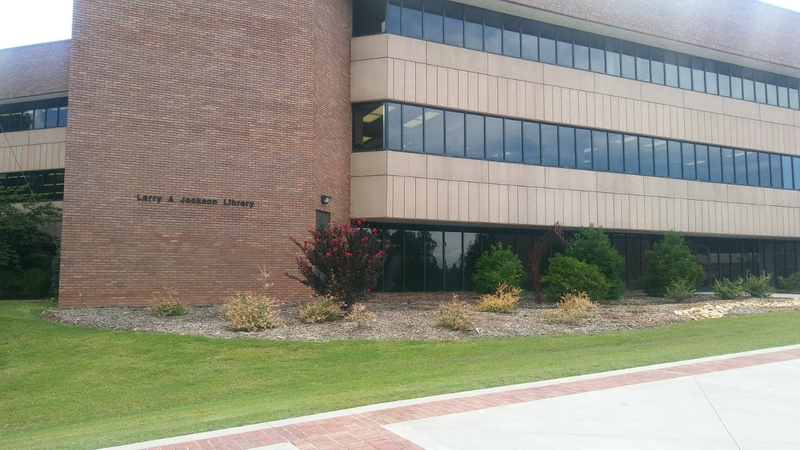 Larry A. Jackson Library. Photo by Ellis McClure. Lander University is in Greenwood, Greenwood County, South Carolina. Greenwood became a county in 1897. Previous to 1897 it was situated in Abbeville County, South Carolina. The town of Greenwood used to be part of Abbeville County. I had never seen this book before, but it made perfect sense why I would discover it here. This book is valuable because it gives list of the town’s voters on May 1885. 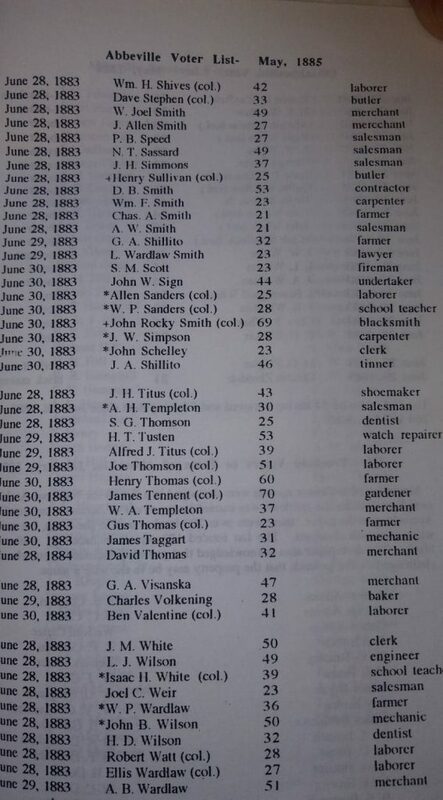 It tells when the voter registered, his age, his race, and occupation. There is an asterisk if he moved since June 28, 1883, and there is a plus sign if the voter had died since registering. There is (col.) next to the name of all colored citizens. 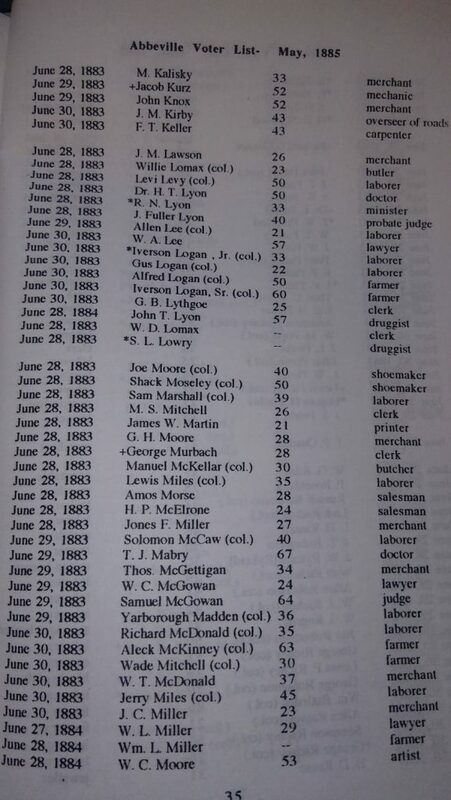 Lowry Ware printed this list which can also be found in the May 20, 1885 issue of The Abbeville Press & Banner. The voters were spotlighted in the paper because the towns people did not want them to vote to build a railroad to Aiken. More on the feelings about what they felt about money going for this venture can be found in the article above. 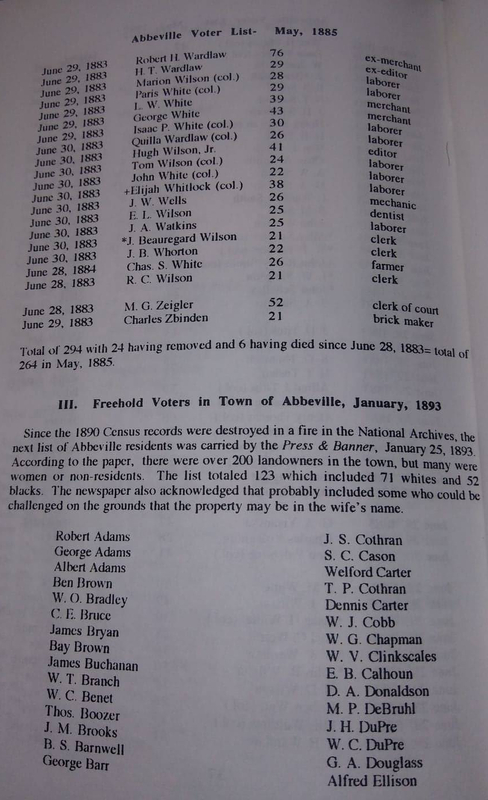 Another valuable list is the voter’s list for the Town of Abbeville in January of 1893 appearing above at the end of page 38 and the beginning of page 39. The 1890 US Census was destroyed for Abbeville making this list very important. It was published in the Press & Banner on January 25, 1893. 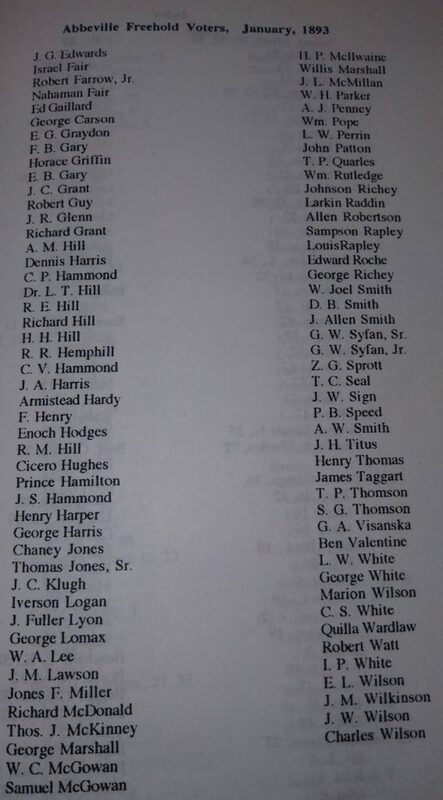 Of the 123 listed, 52 were African American. 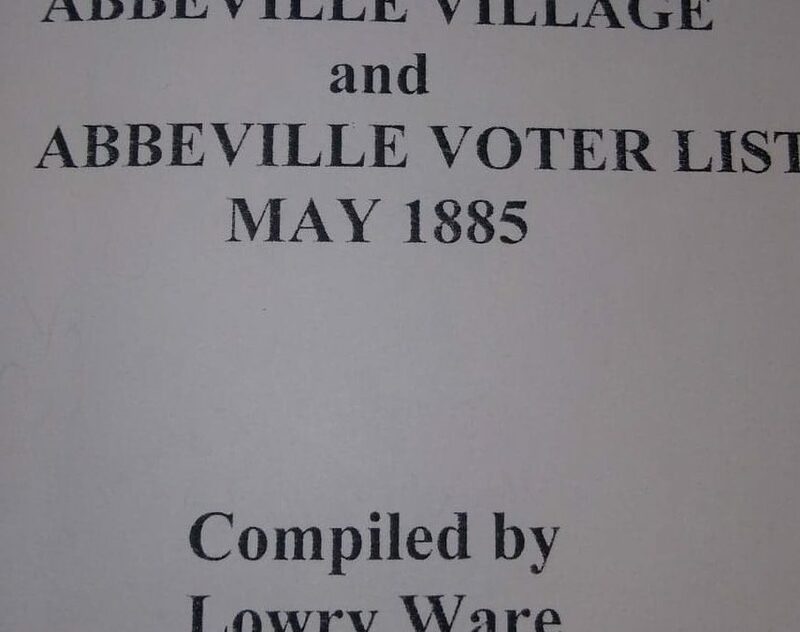 “Census of Abbeville Village and Abbeville Voter List May 1885,” compiled by Lowry Ware. Photo Robin Foster. “Census of Abbeville Village and Abbeville Voter List May 1885,” compiled by Lowry Ware, page 32. Photo Robin Foster. 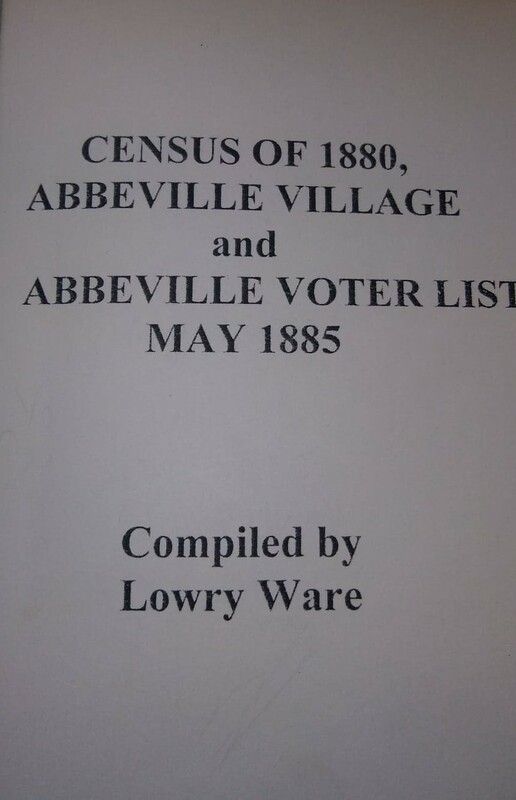 “Census of Abbeville Village and Abbeville Voter List May 1885,” compiled by Lowry Ware, page 33. Photo Robin Foster. “Census of Abbeville Village and Abbeville Voter List May 1885,” compiled by Lowry Ware, page 34. Photo Robin Foster. “Census of Abbeville Village and Abbeville Voter List May 1885,” compiled by Lowry Ware, page 35. Photo Robin Foster. “Census of Abbeville Village and Abbeville Voter List May 1885,” compiled by Lowry Ware, page 36. Photo Robin Foster. 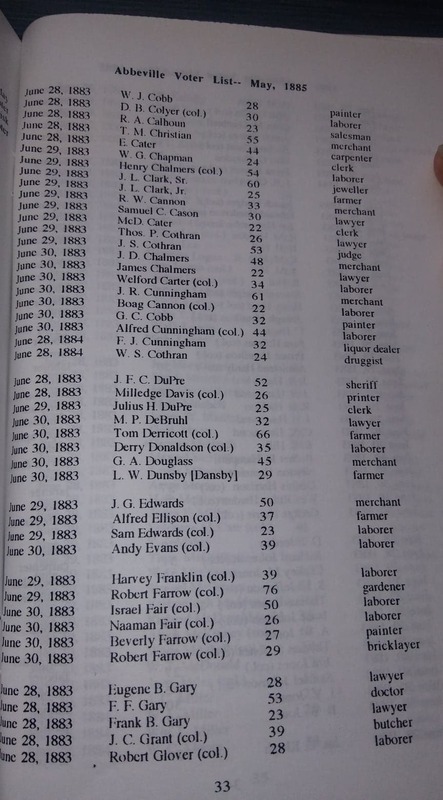 “Census of Abbeville Village and Abbeville Voter List May 1885,” compiled by Lowry Ware, page 37. Photo Robin Foster. 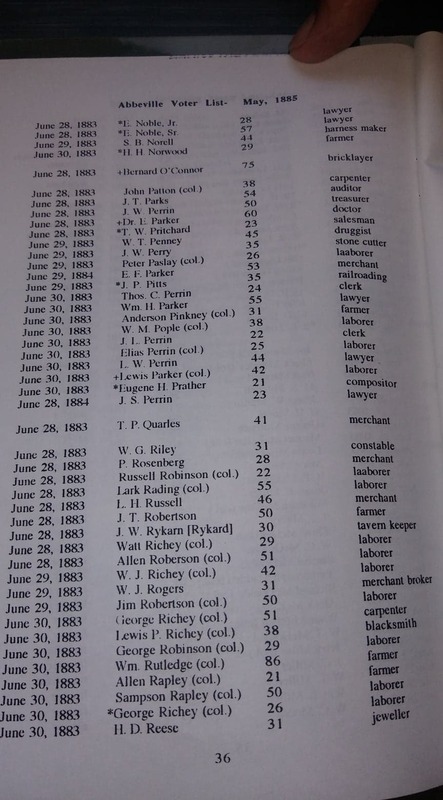 “Census of Abbeville Village and Abbeville Voter List May 1885,” compiled by Lowry Ware, page 38. Photo Robin Foster. “Census of Abbeville Village and Abbeville Voter List May 1885,” compiled by Lowry Ware, page 39. Photo Robin Foster. It was unbelievable to find these voter’s lists for the time period when the 1890 US Census is not available. It makes you wonder what else can I find if I look in the right place. I know several of the families and people listed with so many common surnames shedding light on their families between 1883-1893. I hope that whoever has people in this area can fill in more of the details to their story. Go out and discover more; remember to share. Stop by to tell us how you are doing in our Facebook Group.